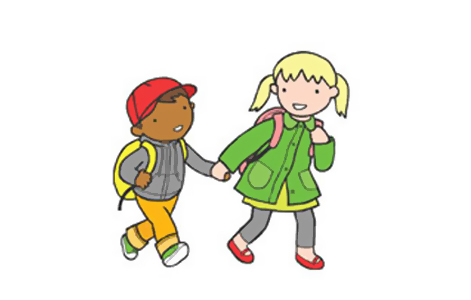 We walk less than we did as kids. And our kids walk less than we did when we were their ages. Sure, we’re busy, always running here and there. And, yes, regardless of where we were born or where we live now, we’ve become a car culture. So imagine you’re trying to change this. You’re trying to leave your car in the driveway and walk to work. To the mall. Or to the mosque. Only you can’t. The streets aren’t safe; there aren’t always sidewalks and drivers don’t always watch where they’re going. Shops and restaurants, and everything else it seems, are too far away. Even if you want to go for a stroll there’s often nothing much of interest to look at; everything looks the same. 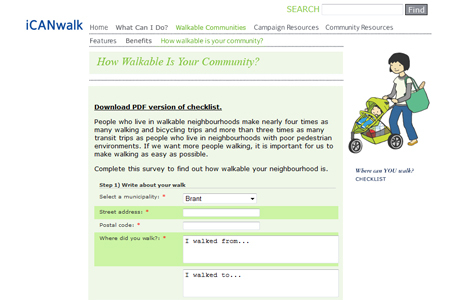 Although walking is the number one activity for Canadians, ask any walker and they’ll agree that many communities aren’t designed for walking. Having worked with the good public health professionals who make up the walkON consortium, wishart knows that a walkable community is one where walking as a form of transportation and leisure is possible. Walkable communities are an important part of a healthy and vibrant community. Communities can encourage citizens to rely on their cars less and choose walking more often. They can make sure that the places people live, work, learn and play are close together so that people can choose walking as a form of everyday transportation. Well-designed, compact communities allow people to walk to school and work, to stores, parks and restaurants. This is good for people, the environment and the economy.